Looking around the interwebs, I came across another bike from the Guggenheim’s “Art of the Motorcycle” exhibit: a gorgeous, screaming orange Laverda SFC. 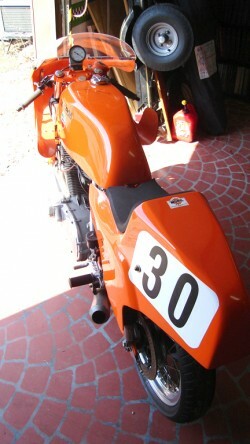 Even if it hadn’t been extremely successful in endurance racing, its place in sport bike history would still have been assured by the stunning looks and noise: a barely-legal racer for the road with lurid orange paint, a sleek half fairing, and a single instrument: a Smiths tachometer. Based out of Breganze, Italy, the Laverda family started out making agricultural machinery, and this tradition of durable, overbuilt engineering found its way into their motorcycle design, Laverda began producing motorcycles in the early 50’s and became famous for their reliable, small-displacement race bikes that competed successfully against more established competition from Ducati, Moto Guzzi, and the like. By the late 60’s, the company was developing a [for the time] big-bore parallel twin to compete with the larger capacity British and American machines. The Laverda reputation for heavy-duty engineering was upheld here: the bikes were solid, over-engineered machines, with five main bearings in the two-cylinder engine. Parts not manufactured by Laverda were all chosen for their quality and reliability: Ceriani suspension, Bosch ignition components and a Japanese Nippon-Denso starter. Built to last, the machines were expensive, heavy, and stable, lending themselves to endurance racing. The ultimate evolution of this concept, embodying the classic Laverda virtues, was the 750 SFC [Super Freni Competizione], first produced in 1971. Highly tuned and filled with quality racing parts, the SFC produced more power than the less exotic road bikes: approximately 71 to 80hp, depending on the year. As you’d expect, they are very rare, with only 549 produced between 1971 and 1976. This one has been extensively tuned and track-prepped and is claimed to have dynoed at 90.5hp. It’s currently in track-only trim with no lights or signals, but the ad mentions that all the stock parts required for road use are included in the sale and there are extensive pictures of these. It does not have the original instrumentation, although the cockpit is comparably spare: a simple, white-faced tachometer by Veglia. Early bikes had either a Laverda drum brake or a magnesium Ceriani four leading shoe front brake. The 1974 model year showed significant development from the earlier bikes, including a new, lower and lighter frame and uprated suspension, along with the triple disc brakes displayed on this bike. The bike has been sitting for a while, but is in excellent condition and should require no more than basic maintenance to get it ready to ride. The ad has extensive, high-quality photos and the seller is obviously very knowledgeable of the bike’s history. When available, these are very pricey, just as you’d expect. This one is listed as “price on application” and should be worth every penny to the right collector.